Improve your playing through private trumpet lessons! The trumpet is a popular brass instrument used in a variety of music. From school band and jazz band to rock and r&b bands, the unmistakable tone of the trumpet plays a prominent role in all musical genres. Students and teachers will follow a clear structure for learning the trumpet using method books and supplementary materials. 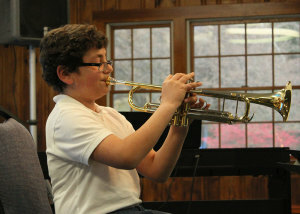 As students progress through their trumpet lessons they will focus on developing their tone, sight reading skills, and improvisational skills. Students as young as 7 or 8 years old will start trumpet lessons. Start playing the trumpet today!